A new version of the Mobile Developer Toolkit is available with support for all Infor CRM Mobile versions, including 3.5. See the github repo for the Mobile Developer Toolkit on github. Huge thanks to Jason Best from Infor for the pull request to get it up to date! Hi. I’n starting development in an Infor CRM 8.4/Mobile 3.6 environment. 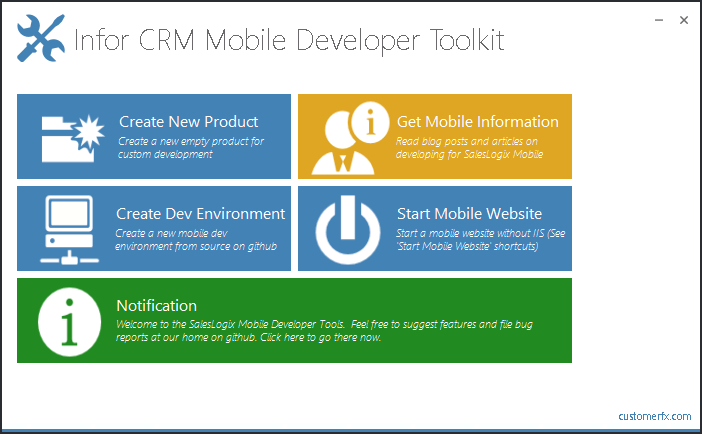 Is the Infor CRM Mobile Development toolkit compatible with Mobile 3.6? I installed the current version of the toolkit, but when I try to set up my dev environment, it errors on extracting the argos-sdk-3.5 zip file, and when I look at that zip file, it’s empty. Just wanted to know if the toolkit is compatible with 3.6 to see if this is worth the time to troubleshoot. Thanks.